Yesterday, I was contacted by another real person about another fake interview wherein you recount your past struggles in the boudoir. I’ve gotten the “article” removed from several sites, but it continues to pop up, (if you will,) all over the place. So I’ve been busy playing Whack-a-Mole, (as it were,) trying to protect your reputation between the sheets. 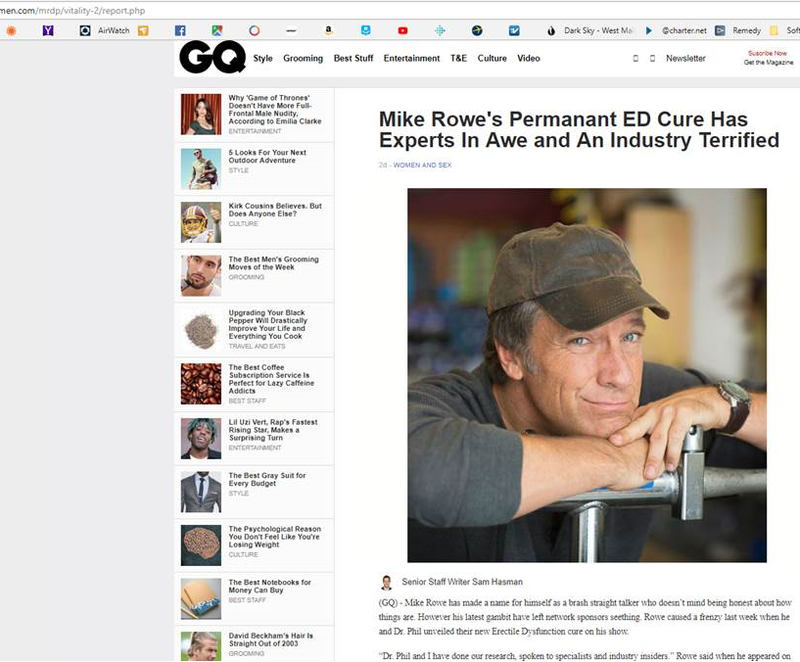 Anyway, I reported this to Instagram, who promptly banished this latest fake Mike Rowe, which made the real Shari feel very satisfied. Unfortunately, I was just contacted by another real fan, telling me that yet another fake Mike Rowe, was trying to arrange yet another real meeting. I’ve alerted Instagram, again. Like Shari, I prefer to maintain a sense of humor about the tumescence of my tallywacker, as well as the flurry of impostors out there claiming to be me. (I can’t imagine these two scams are related, although I suppose there’s a certain logic in pretending to be someone who just stumbled upon the secret of sexual dynamism.) Either way, the Instagram thing is a potentially serious problem, because some of these Fake Mike Rowe’s are trying to arrange personal meetings. And some apparently, have succeeded. Not much I can do about that, other than remind everyone here that while I adore you all, I’ll never contact you on social media, or suggest we met in real life. Never ever. The internet is seething with fake articles about real celebrities talking candidly about their bad skin, their flabby arms, their yellow teeth, their crossed-eyes, their rolls of fat, and of course, their problems below the belt. Invariably, the real celebrities in these fake articles credit a product they’ve never heard of with curing their imaginary condition. Others, (like me, apparently,) are so grateful for their miraculous transformation, they go into business with Dr. Phil, so that other men trying to shoot pool with a wet noodle might find hope. My business is built on trust, as is my foundation. And so, I spend a lot of time online, trying to reinforce that trust with those who find me interesting enough to keep up with. But the truth is, the Internet should not be trusted, and neither should I. Not because I’ve been untrustworthy – I haven’t. But because I can’t very well ask you to believe me, without being able to assure you that the words attributed to me are actually mine. And that’s no longer possible online.